This was a delicious treat and pretty easy to make. If you're a pumpkin fan, you will want to try this recipe since pumpkin pie filling is readily available this time of year. As much as I like making cakes, it can be a lot of work. 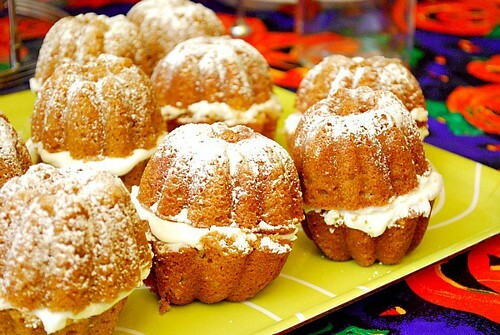 These were a cinch because of the mini pumpkin cake pan I used. And rather than frosting the outside of each pumpkin cake, I decided to take the fun and easy route by frosting the middles of each mini cake pumpkin to "stuff" them. It makes it easy to eat and it's much more portable too... which is helpful if you want to bring a cake along as you walk through the neighborhood trick or treating! Preheat oven to 350°. Coat a 13x9" baking pan or mini pumpkin cake pan with cooking spray, set aside. Combine flour, baking powder, cinnamon, and salt in a medium bowl with a whisk. Set aside. Stir sugar, butter, and vanilla together in a large bowl; beat with a mixer at medium speed til well combined. Add in eggs, 1 at a time, to sugar mixture; beating well after each addition. Stir in pumpkin; mix well. Fold in flour mixture. Place batter into prepared baking pan. Bake 25 minutes or til a toothpick inserted in the center comes out clean. Cool completely in pan on a wire rack. For the frosting, combine butter, vanilla and cream cheese in a medium bowl; mix with a mixer at medium speed til combined. Gradually add the powdered sugar, beating til well combined and smooth. 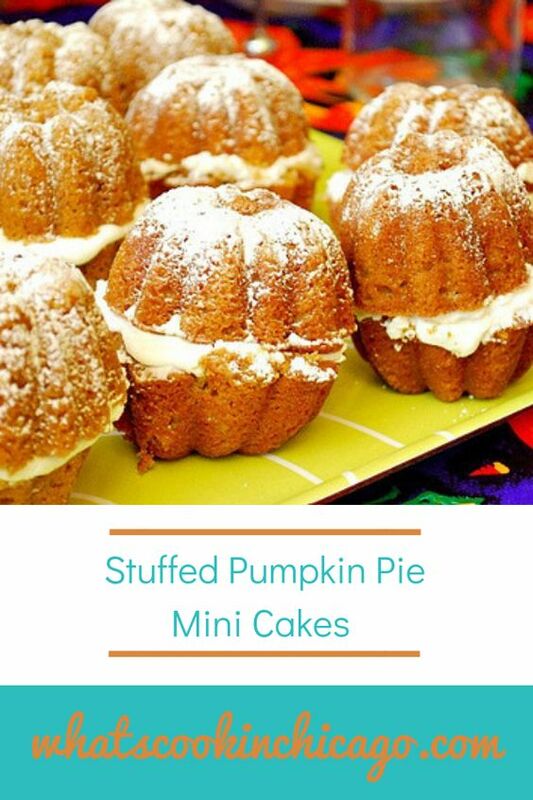 Spread frosting evenly over top of cooled cake or if using mini pumpkin cake pan, spread frosting in between each half and serve dusted with powdered sugar (optional). Wow! Those look amazing! But your stuff always does.